As a child, Joyce Giraud remembers her mother and grandmother mixing “magical potions” in her kitchen. Wanting to share her passion, Joyce blended her hair styling knowledge with the foundational ingredients from her family's recipes. Treat yourself and your hair with a luxe collection of exotic beauty products. Joyce Giraud is an actress, producer, philanthropist, wife, and mother of two. She was raised in Puerto Rico by a single mom whom she calls her hero and credits with inspiring her to always strive for the best and to never give up. Joyce's experience as a celebrated international top model gave her the opportunity to explore the world and discover the most unique products and beauty ingredients in the world. As a young girl, Joyce Giraud remembers her mother and grandmother mixing “magical potions” in her kitchen. They'd spend hours combining ingredients to ultimately create a family recipe for exceptional skin and hair care that included Puerto Rican Buriti Oil and Passion Fruit, the star of their signature scent. 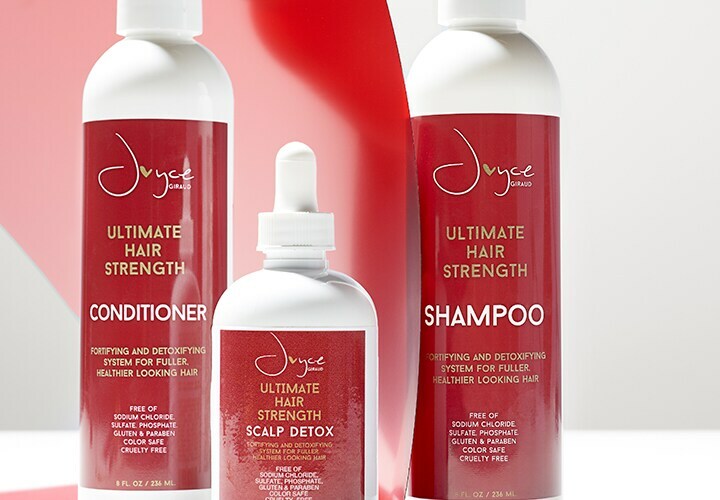 Wanting to share her family’s passions, Joyce has blended her knowledge of styling hair from her many years modeling and acting with the foundational ingredients from her family’s “magical potions” to create a collection that helps keep your hair and skin soft, supple and strong. Joyce’s paraben and sulfate-free formulations nourish and protect, while helping deliver glossy-smooth finishes you’ll love. So, treat yourself and your hair between carpools and precious date nights with Joyce Giraud's luxe collection of exotic beauty products. Joyce Giraud is an actress, producer, philanthropist, wife and mother of two. Born and raised in Puerto Rico by a single mom whom she calls her hero and credits with inspiring her to always strive for the best and to never give up. Her experience as a celebrated international top model gave her the opportunity to explore the world and discover the most unique products and beauty ingredients in the world.